KUALA LUMPUR: The property sector may experience an oversupply next year due to a burst of launches from developers that have been held back since the start of the global economic crisis. Association of Valuers, Property Managers, Estate Agents and Property Consultants in the Private Sector, Malaysia (PEPS) president James Wong said developers would need to come up with “creative ways” to maximise sales. “Because there will be a lot of launches next year, there will be a lot of supply, and the success of the take-up rates will depend on the marketing strategies of the developers,” he told a press conference on the 3rd Malaysian Property Summit 2010 yesterday. Ho Chin Soon Research Sdn Bhd director Ho Chin Soon concurred, adding that there would be a pent-up from buyers that had been eager to get into the housing market. “A lot of developers I have spoken to are preparing to launch in 2010. After over a year of waiting (since the global economic downturn hit), the public is hungry!” he said. Wong said property transactions for 2010 were expected to be better than 2009, adding that the residential sector would see the biggest growth. Wong added that the secondary market for upmarket condominiums would remain soft until the second half of 2010 because of existing oversupply and new launches. “However, the secondary market for landed residential property remains firm,” he said, adding that the average occupancy of high-end condominiums within the KLCC area was about 60%, with yields hovering at 5% to 6%. “Many office building projects started two to three years ago are nearing completion and therefore are facing occupancy problems as companies are postponing decisions to relocate to bigger and more expensive premises. “Hence the take-up rate of new Grade A office buildings in Kuala lumpur remains slow. Office rents will come down as more supplies (completed units) come in (to the market) by end-2010,” he said, adding that the hotels and industrial sectors should remain flat next year. Wong said the hotel occupancy rate in Kuala Lumpur in the third quarter of 2009 was 66%, with average room rates reported at RM277. “Owing to competition, many hotels are undergoing rebranding and refurbishment exercises,” he said. 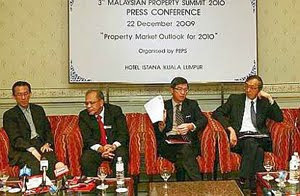 PEPS will be organising the 3rd Malaysian Property Summit 2010 on Jan 26, 2010 at the Sime Darby Convention Centre. Malaysia's property sector is expected to rebound next year after experiencing a drop in the last two years due to the global economic crisis. Association of Valuers, Property Managers, Estate Agents and Property Consultants in the Private Sector Malaysia (PEPS) president James Wong Kwong Onn said many property companies are planning a comeback next year after a two-year hiatus that saw them adopting a wait-and-see approach. "We expect to see an increase (in launches), especially in the residential sector. But it will still remain a buyers' market," Wong told a press conference to announce the Third Malaysian Property Summit 2010, which will be held on January 26, in Kuala Lumpur yesterday. According to Wong the trend is the properties will be located more in areas where the new LRT line will be coming up as a lot of developers have purchased land around these areas, which are meant for residential development. He expects the residential property market to see a pick-up as more people marry and have children. "Although our property market is not recovering as fast as Singapore and Indonesia but viewed in perspective, our initial drop of 10-15 per cent (in demand) at the end 2008 was less severe as compared with Singapore and Indonesia's 25-30 per cent. As a result, Singapore and Indonesia have subsequently staged a higher percentage rate of recovery whereas the recovery in Malaysia showed a slower rate," he said. Wong said foreign purchase may be affected by the reinstatement of the real property gains tax (RPGT) in January. Although the projected 5 per cent drop in potential capital gain is relatively small, its repercussions may be more damaging as it has reinforced a perception by foreign investors that government regulations in Malaysia are not consistent and this increases the risks of investments here. He added that this may significantly affect foreign direct investment into the country next year. "When RPGT was introduced, the objective was to curb speculation. If this is still the rationale for RPGT, then properties purchased and held for more than five years as an investment and not speculative should not be subject to RPGT. "We strongly urge the government to exempt RPGT for properties held more than five years, and bring forward the base year to January 1 2000," he added. NAZA Group has drafted Kumpulan Jetson Bhd as a partner to develop the country's largest exhibition centre on 62.45 acres of prime federal land off Jalan Duta in Kuala Lumpur. Naza, through wholly-owned TTDI KL Metropolis Sdn Bhd, and Kumpulan Jetson yesterday sealed a pact to form a 51:49 joint venture (JV) called TTDI Jetson Sdn Bhd. Kumpulan Jetson will eventually get a RM628 million job to build the proposed Matrade Centre, which will have a one million sq ft of gross floor area. TTDI Jetson will sign a proper development agreement with TTDI KL Metropolis once Kumpulan Jetson has obtained shareholders' nod for the proposed JV at an extraordinary general meeting to be convened soon. TTDI Jetson will then award Kumpulan Jetson the contract to build the Matrade Centre for RM628 million, the latter said in a statement to Bursa Malaysia yesterday. 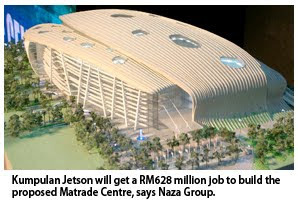 "The company will carry out the planning, design, construction and complete the Matrade Centre," Kumpulan Jetson said. Naza Group joint executive chairman SM Nasarudin SM Nasimuddin and director SM Faliq SM Nasimuddin are major shareholders of Kumpulan Jetson, with a combined 29.79 per cent stake. The brothers recently made an unsuccessful bid to buy the remaining Kumpulan Jetson shares not already owned by them. TTDI KL Metropolis was previously awarded the privatisation of the 62.45-acre land by the government via a deal signed on December 21 this year. The company will build the Matrade Centre for the government at its own cost. In return for the exhibition centre, TTDI KL Metropolis has the exclusive rights to develop the land into a mixed project tentatively dubbed the "Naza KL Metropolis Development". The project will boast of hotels, offices, residences and shopping malls, with a gross development value of RM15 billion over 15-20 years. Naza and Kumpulan Jetson have estimated that they would have to fork out some RM800 million to render Matrade Centre functional plus the land premium for conversion of the 25ha into commercial status. Given its 49 per cent shareholding in TTDI Jetson, Kumpulan Jetson said its portion would amount to at least RM392 million. KUALA LUMPUR: Malaysia Pacific Corp Bhd (MP Corp) hopes to start the construction of the RM4bil Asia Pacific Trade & Expo City (APTEC) in Iskandar Malaysia next year. President and chief executive officer Datuk Bill C.P. Ch’ng said the company was finalising joint-venture partners for various parcels of the project which he dubbed as “a unique one-stop sourcing and trade centre”. “This is a very ambitious project and we are targeting to complete everything within eight years,” he told reporters after the group’s AGM yesterday. Ch’ng said the intention was to build the whole place in one go, saying that the project was not designed to be operated on a “piece-meal” basis. To do this, APTEC will be broken up into 18 or 20 different parcels, each to be funded separately. By dividing the project into smaller parcels and forming joint ventures, Ch’ng said the various components would be able to take off simultaneously without incurring heavy financial burden to the company. MP Corp had pared down net current liabilities to just RM5.6mil as at June 30 compared with RM150mil a year ago. The company had proposed to issue rights shares earlier this year to raise as much as RM54mil and to enlarge its capital base. This would enable it to undertake “substantial corporate exercise in the pipeline,” Ch’ng said in his statement in the group’s latest annual report. At the briefing, Ch’ng walked through the APTEC that will accommodate a total of 2.5 million sq ft of exhibition space in four trade halls as well as retail malls. Hotels, including a 50-storey five-star property, as well as offices and commercial units are being planned on the 60-acre site. “We are not just building the hotel but we want to find the right partner who can operate it,” Ch’ng said. He declined to reveal any of the potential or identified partners but said that “more announcements” would be made next year. Last week, MP Corp announced that Asia Pacific Trade & Expo City Sdn Bhd (APTEC SB) had signed a letter of intent with a potential partner from Thailand to explore join-venture possibilities related to the project. APTEC SB is a unit of Lakehill Resorts Development Sdn Bhd. MP Corp owns a 78% stake in Lakehill while the rest is held by AmanahRaya Bhd. The APTEC project will be surrounded by a mixed development undertaken by Lakehill. When it comes to super high-end properties, few can rival the RM120 million Perdana Lakeview West project located along Persiaran Tasik in Cyberjaya, Selangor. Targeted at leaders and captains of industry who demand the very best, Perdana Lakeview West commands picturesque views of Putrajaya Lake and its lakeside promenade against the majestic skyline of Putrajaya. In a statement, property developer Setia Haruman Sdn Bhd said one of the captivating locales here is The Riverine Estuary that overlooks a private riverside park designed to exude an aura of calm and tranquility. Every private residence of Perdana Lakeview West is also a sublime expression of distinction and luxury, where each boasts a wealth of indulgences, from colossal bedrooms with pools and fine finishes. The development comprises 47 units, ranging from 14,832 sq ft to 42,683 sq ft. Prices start from RM1,733,888 to RM5,122,888 per unit. Security is provided with a dedicated guardhouse to manage and control access into this exclusive lakefront community. KUALA LUMPUR: Asking rental prices for the local residential market in 2010 is expected to be determined by inflationary pressures from fluctuating oil prices rather than by demand, said Ho Chin Soon Research Sdn Bhd director Ho Chin Soon. “When inflation comes in, people like you and me will ask for a salary increase. During Pak lah’s (former Prime Minister Tun Abdullah Ahmad Badawi) time, there was a (widespread) salary increase. When that goes up, landlords know they can ask for higher rentals,” he said. Ho said inflationary pressures were directly related to rising oil prices. “When oil prices go up, inflationary pressures kick in. Asking (rental) prices will be determined by inflation rather than (by) demand,” Ho said at a press conference on the 3rd Malaysian Property Summit 2010 yesterday. With the improving economic climate, crude oil price is expected to increase. He said the Government had already “subtly” increased petrol prices when it introduced the RON 95-grade fuel earlier this year. RON 95 fuel is priced at RM1.80, five sen higher than that of RON 92 (which has been discontinued) while the price of RON97 went up to RM2.05 from RM1.80. “The Government already gave a signal that petrol prices is going up by introducing the RON 95 fuel. 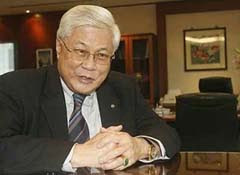 My fear is that next year, the Goverment may not be able to sustain the rising oil prices (and reduce subsidies),” said Ho. At press time, crude oil price was at US$73.83 a barrel on the Nymex. Association of Valuers, Property Managers, Estate Agents and Property Consultants in the Private Sector, Malaysia (PEPS) president James Wong said rental prices for Grade A offices peaked at RM8 per sq ft in the third quarter of 2008 prior to the global downturn. “Asking prices (for Grade A offices) currently stand at RM7 per sq ft. For upmarket condominiums, it used to be between RM3.50 and RM5 but that has somehow stabilised. “For new completed condominiums, if they are hungry for tenants, the landlords may reduce rental prices,” he said, adding that rentals of shopping malls were unaffected by the economic slowdown. “During the crisis, many tenants asked to have their rates reduced but there was no reduction. For malls like KLCC and Pavilion, the landlords were also able to replace their tenants quickly,” he said. On another note, the Valuation and Property Services Department director-general Datuk Abdullah Thalith Md Thani said the Government’s proposal to reimpose the real property gains tax (RPGT) at 5% effective Jan 1 was unlikely to have a major impact on the local property sector. “The property sector will be determined by the health of the economy. The RPGT will only have an impact on the seller and not the buyer,” he said, adding that 5% was a small amount. Wong said the imposition of the RPGT would have a positive effect. “Without the RPGT, a seller could over and under-declare the real value of his property,” he reckoned. PETALING JAYA: Glomac Bhd posted a higher net profit of RM9.3mil in its second quarter ended Oct 3 against RM7.7mil in the previous corresponding period. Revenue for the period was lower by 17% at RM75.6mil compared with RM91mil previously partly due to the completion of its Suria Stonor condominium project, the company said in a statement yesterday. Earnings per share stood at 3.26 sen compared with 2.74 sen before. Group executive chairman Tan Sri F.D. Mansor said: “Robust development activities and a strengthened balance sheet have placed us on a stronger growth platform. The group turned in a net cash position of RM19.9mil as at end-October, and is expected to improve further with proceeds from the disposal of its investment properties earlier in the year. “Going forward, our recent acquisition of 7.6 acres in Petaling Jaya for RM31.2mil will add to the group’s already strong prime future development projects,” he added. PROPERTY developer Mah Sing Group Bhd, which recently inked a RM2.1 billion mixed development deal in China's Jiangsu province, plans to explore other potential investment opportunities there. This intention was expressed by its group managing director, Tan Sri Leong Hoy Kum, to Jiangsu party secretary Liang Bao Hua at a meeting in Kuala Lumpur yesterday. During the meeting, Liang suggested that Mah Sing not only develop residential projects but also commercial projects including offices and projects to support the logistics and services industry such as hotels in the province. He also highlighted the viability of exploring the coastal areas of Jiangsu where there can be more investment opportunities due to their current development status. "The investment in Wujin, Jiangsu, is an integral step to the crystallisation of Mah Sing's vision of establishing a global footprint and the group intends to develop an iconic project in Wujin," the company said in a statement released yesterday. Leong said the Mah Sing Group, with 21 projects in Malaysia, has a vision to be a world-class regional developer. "We are confident of creating an outstanding development providing unique lifestyle experiences which will transform the way people live, work and play in Wujin. We are committed to bringing Mah Sing's hallmark quality, from master planning and design to construction and successful completion to our project in China," he said. Leong added that due to Mah Sing's recognition and track record, the group has a strong international network that it can tap on. For the Wujin project, Mah Sing will partner Chinese counterpart Danlong Realty (Beijing) Co Ltd to form a 51:49 joint venture that will invest RM270 million in proportion to their stakeholdings as registered capital. Also at the meeting yesterday was Danlong's president Xue Yong Zhe. PETALING JAYA: Eastern & Oriental Bhd (E&O) is selling a parcel of freehold land in Kuala Lumpur measuring 4,651 sq metres to Menara Hap Seng Sdn Bhd for RM103mil in cash. In a statement to Bursa Malaysia yesterday, the company said Radiant Kiara Sdn Bhd, a wholly-owned subsidiary of Matrix Promenade Sdn Bhd, which in turn is a wholly-owned subsidiary of E&O, had entered into a sale and purchase agreement with Menara Hap Seng for the sale of the land. E&O said the sale was in line with its strategy of preserving capital value and strengthening balance sheet, adding that the cash could be deployed in other projects and investments to maximise returns or for the repayment of borrowings. It added that preliminary structure and piling works had been carried out on the vacant piece of land. The sale would not have any effect on the issued and paid-up share capital and substantial shareholders’ shareholdings of the company, and that the transaction is expected to be completed by the first quarter of 2010, according to E&O.